Do you ever feel like you’re too busy, too stressed or just too distracted to concentrate and get work done? In “Unlimited Memory,” you’ll learn how the world’s best memory masters get themselves to concentrate at will, anytime they want. When you can easily focus and concentrate on the task at hand, and store and recall useful information, you can easily double your productivity and eliminate wasted time, stress and mistakes at work. 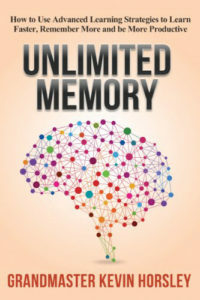 In this book, you’ll find the tools, strategies and techniques you need to improve your memory. You will learn about the three bad habits that keep you from easily remembering important information. You will understand how a simple pattern of thinking can stop you from imprinting and remembering key facts, figures and ideas. You will be taught how to master your attention so you can focus and concentrate longer, even during challenging or stressful situations. You will discover how to use your car to remember anything you want without writing anything down. You will learn how to develop simple methods that allow you to nail down tough information or complex concepts quickly and easily. In addition, you will learn how to combine your long-term memory and short-term memory to create instant recall for tests, presentations and important projects. What if you could say goodbye to confusion? What if you had a way to uncover what you were truly meant to do? 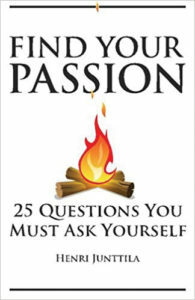 In “Find Your Passion: 25 Questions You Must Ask Yourself,” you’ll discover a powerful set of questions that will help you do exactly that. Henri Junttila has been helping people find and follow their passion for more than a decade, and some of the things Junttila discovered are weird, surprising, and fascinating all at the same time. In this book, Junttila shares a simple process that will help you gain more clarity, and access the answers that were always waiting within you. Here’s a taste of what you’ll discover when you read this book: How your definition of passion stops you from living the life you want; a simple way to connect to your inner wisdom (and get the guidance you need); how to discover if you’re on the right track (or on the wrong track); tap into your personality to uncover your true passion and purpose; why using negativity can dramatically increase the positivity in your life; how to activate the creative problem-solving powers of your brain; uncovering what’s really holding you back from getting what you want; and a powerful exercise that will help you easily overcome challenges in your life.